So I tend to think about my childhood this time of year. 1.) Fireflies. I remember going out after dark to chase these in the yard. Not sure if I ever actually captured one in the jar. But that didn’t matter. It’s the memory of being completely enchanted by that living, dancing light. 2.) Ice Cream Trucks. The neighborhood kids and I lived for the sound of that ice cream truck music in the month of July. To the point where we tried to keep a couple of dollars in our pockets every day, “just in case” (you never knew which day would be your lucky day). 3.) Reading by Flashlight. I was a bookworm, always. It was pure delight to stay up ’till any hour of the night, swept away by the drama of my latest novel, because there was no school to worry about the following day or, oh, the following two months. 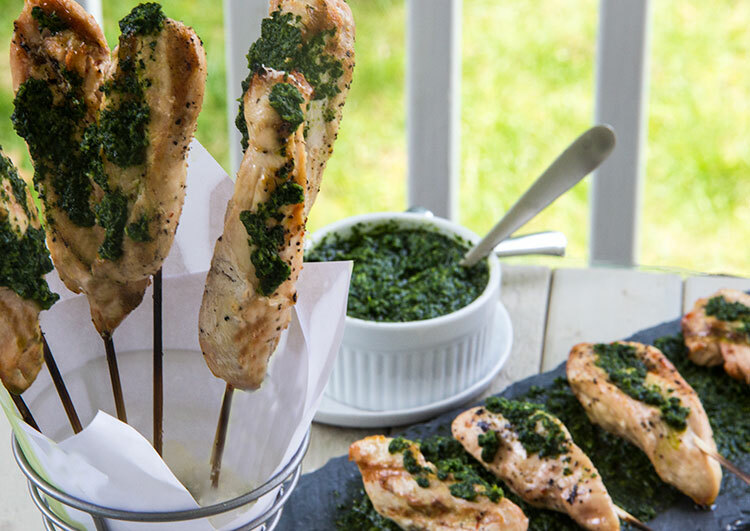 I think these chicken caesar skewers are ideal for the July 4th holiday. They could serve as an appetizer or, alongside salad and rice, an entrée. First off, this recipe involves just a bit of pre-planning. I am horrible at this, foodwise (I can’t count the number of times I remembered to take the meat out of the freezer, oh, about 10 minutes before I wanted to begin cooking dinner). But this is actually the simplest of pre-planning: wooden skewers should be soaked in water before being placed on the grill. 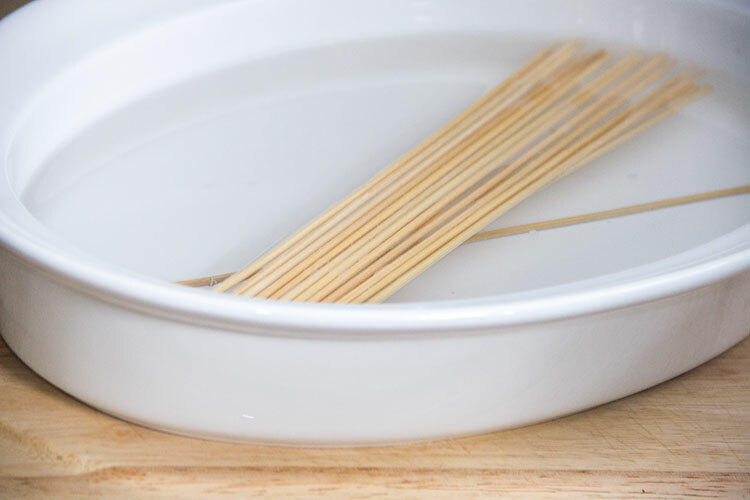 So about 1 hour before you plan to prepare the recipe, place the skewers in a “bath” of water for a good soak. Next, prepare the grill for medium heat. 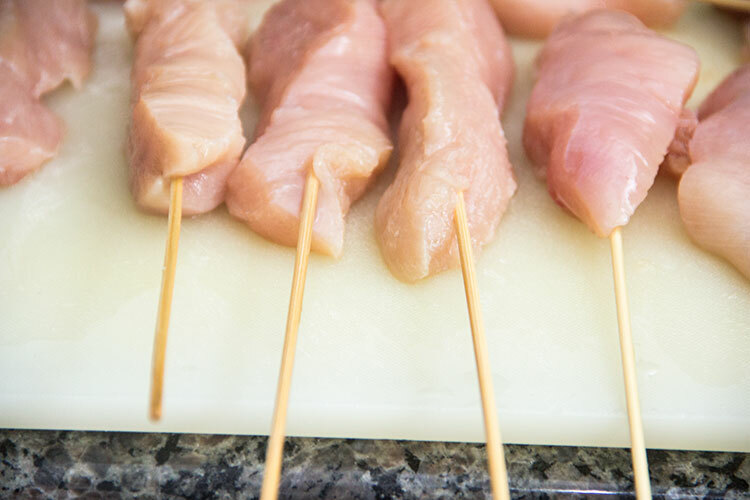 Cut some skinless, boneless chicken breasts lengthwise into thick strips, and skewer each one. Place them on the grill. Place them near the edge so that the wooden skewers don’t actually touch the grill – the chicken should cook without the skewers burning and charring this way. Allow them to cook about 7-9 minutes, then flip and cook another 7-9 minutes. If you don’t touch the chicken during cooking and only flip once – you should end up with some golden, light grill marks. Meanwhile, prepare the caesar dressing. Instead of a traditional high calorie, high fat cream-based dressing, my caesar is oil based. This means it’s low in saturated fat and full of heart-healthy extra virgin olive oil. Olive oil is chock-full of the good kind of monounsaturated fat that is great for healthy skin and hair. It’s also loaded with polyphenols, cancer-preventing antioxidants. 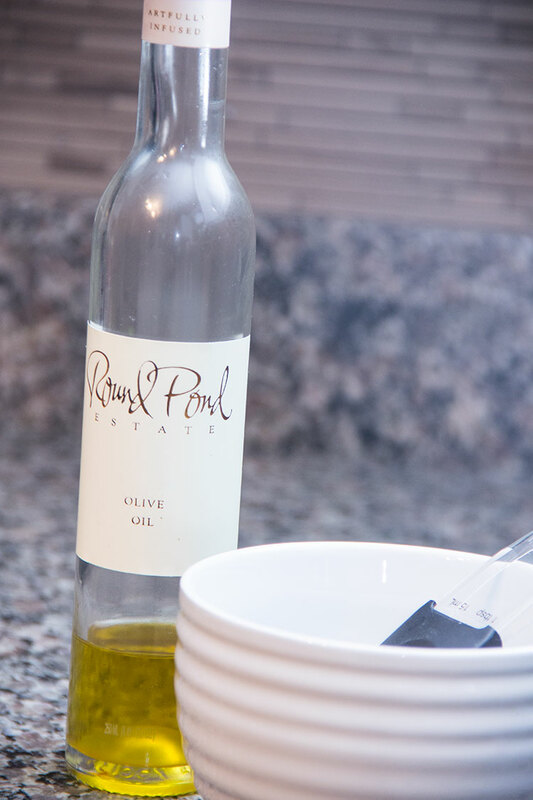 Since the flavor of the olive oil really counts in this recipe, look for a high quality extra virgin olive oil. It costs a bit more, (so save it only for dressings where you won’t be heating the oil to high temperatures) but the extra virgin kind will give you the very best flavor. One other thing to note about my caesar: it’s designed to be brushed onto the chicken after it’s been cooked, as a kind of sauce. So this is the easiest kind of recipe. 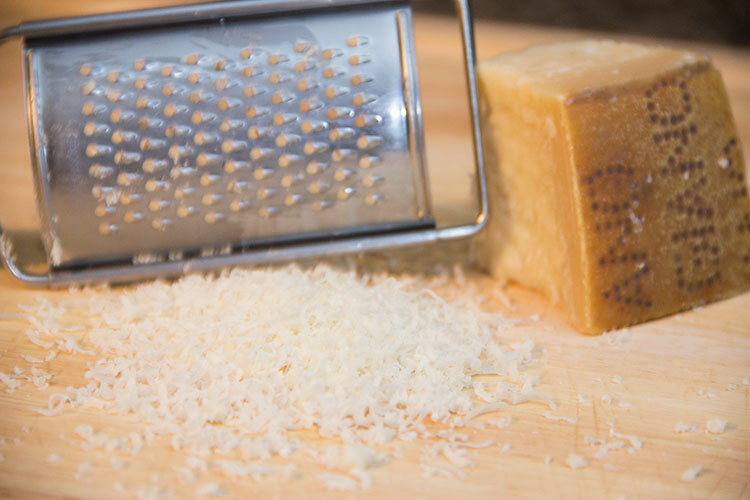 Begin by grating some fresh Parmigiano-Reggiano cheese. 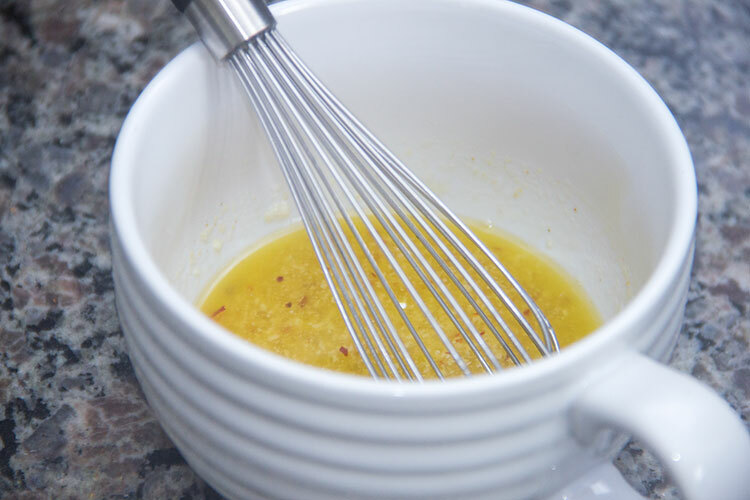 Next, in a small mixing bowl, whisk together the extra virgin olive oil, some white wine vinegar, the grated parmesan, some crushed red pepper flakes, garlic powder, a pinch of salt, and some anchovy paste. This is not nearly as bad as it may sound. My promise: you will not taste an anchovy-like flavor in this caesar dressing. Meat-and-Potatoes-Guy was doubtful about this paste, but he could not detect it in the dish. Also prepare the kale pesto. Step-by-step photo instructions on how to prepare the kale pesto are included with my Veggie Pasta with Parmesan and Kale Pesto dish. The recipe makes quite a lot of kale pesto, so I like to use half of the pesto for the chicken skewers and save half to prepare the veggie pasta the following night. When the chicken is fully cooked through, arrange the skewers on a platter and brush the marinade all over the chicken. Serve the kale pesto alongside, as a dipping sauce. The flavors of the caesar dressing are flavorful and bold. With hints of heat from the red pepper flakes and lots of yummy parmesan coming through. 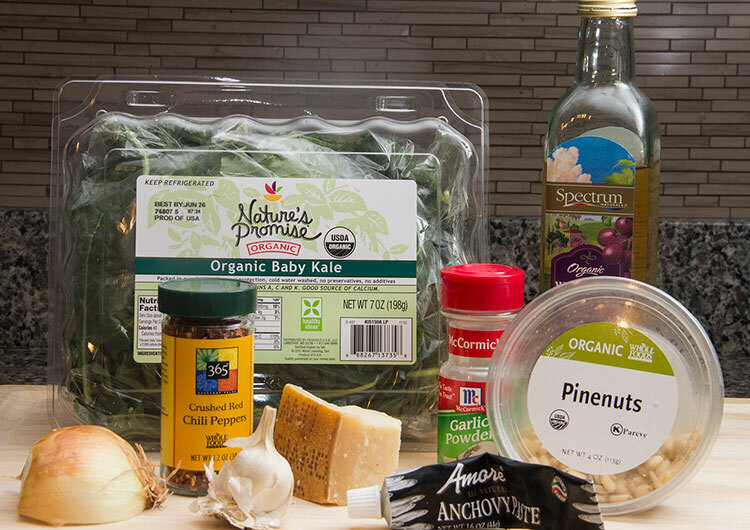 And the richly flavored, nutty kale pesto complements the caesar perfectly. Tasty, unique, nutritious, and easy. This one is in constant rotation during the summer months at my house. Skewer each chicken strip. Season with salt and pepper. 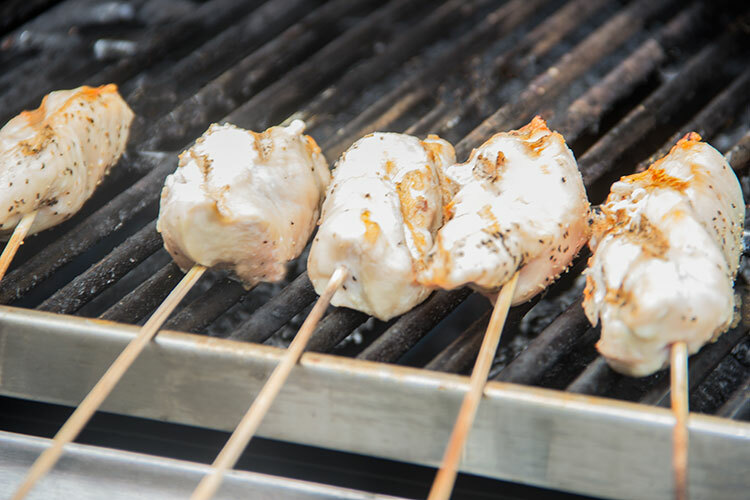 Arrange chicken at the edge of the grill so that the wooden skewers overhang and do not touch the grill. Grill chicken for about 7-9 minutes, flip and cook about 7-9 minutes more, or until chicken is lightly golden and cooked throughout. Meanwhile, in a small mixing bowl, whisk together the olive oil, vinegar, parmesan, anchovy paste, garlic powder, and red pepper flakes. Season with a pinch of salt. Arrange cooked chicken skewers on a platter and brush the caesar marinade all over the chicken. Serve Kale Pesto alongside, as a dipping sauce. Arrange the pine nuts on a parchment-lined baking sheet and toast in the oven for about 5-7 minutes, or until the pine nuts are lightly golden – watch carefully, as they burn quickly. Heat ⅓ cup olive oil in a large sauté pan over medium-high heat and add the garlic, onion, and kale. Season well with salt and pepper, and sauté about 6-9 minutes, or until veggies are softened. Transfer about half the kale mixture to a food processor and pulse until mixture is puréed. Add the rest of the mixture and pulse again. Add the pine nuts and pulse until a thick, smooth consistency is reached. Jen, this just up my alley …. just love everything about Caesar close to it .. 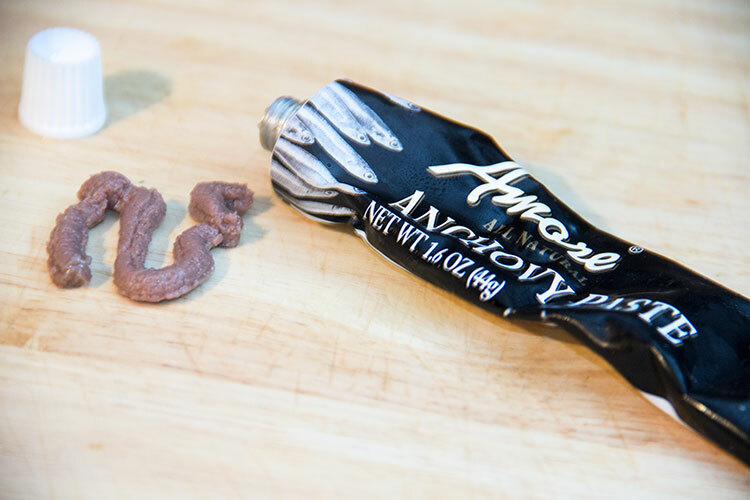 I love the anchovy paste – wish we had something like that over here. We have to use something called “sardelles”. I’m not a big fan of kale but I know it’s truly superfood …. so maybe as a pesto. Going to be in my mom’s apartment the rest of the week .. so next week, I will try this .. and I will let you know. I wish you and your boys … a truly wonderful 4th of July. Your recipe looks so flavoursome and of course, love the photos! Once again you deliver wonderfully 🙂 . I Love any kind of healthy party dishes. I think I might try it with prawns instead! Oh these look so great! Fun and easy to make quickly, healthy and delicious! I love kale pesto and this is a wonderful use for it! Also love your wire holder! These skewers look SO delicious! They totally scream “summer BBQ” too. PS. I totally remember reading books by flashlight during the summer when I was a kid. Sometimes I’d stay up half the night reading! I live across the street from a small city park so the ice cream truck come through every afternoon. It plays the same music as the one I grew up buying from. What fun! What a tasty marinade for the chicken. Love the kale pesto! Have happy 4th! 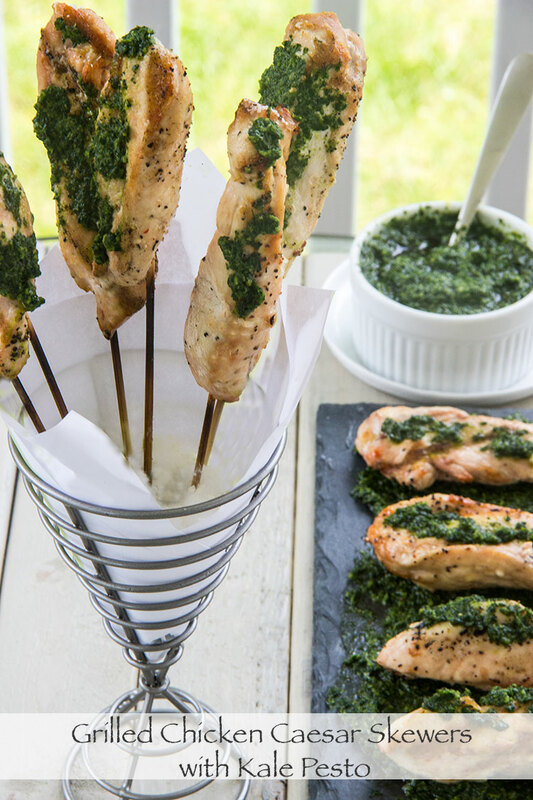 I love chicken skewers, great idea to serve them with pesto!